If you need brain or spinal surgery, it’s not unusual to feel a great deal of stress. You may think you need to make important decisions quickly. You may even be concerned that you don’t have all the information you need. That's why it's important for you to know that at UR Medicine Neurosurgery, our focus is on wellness, excellent outcomes and quality of life, not just procedures and surgery. If you do need surgery, we have world class technology, including the computer assisted image guidance, functional MRI and awake brain mapping. Our UR Medicine Neurosurgery team provides the widest range of neurosurgery and neuromedicine care in the region. We provide true comprehensive care and proudly serve patients throughout the Finger Lakes, Southern Tier and Western New York. We also strive to make brain and spinal care convenient, by providing care at several regional locations. UR Medicine Neurosurgery has numerous Programs of Excellence. These programs provide advanced neurosurgical care in highly specialized areas. The UR Medicine Neurosurgery team provides the widest range of neurosurgery and neuromedicine care in the region. 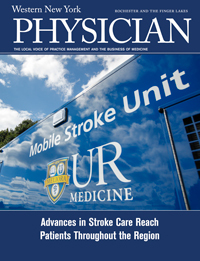 UR Medicine, in partnership with American Medical Response, has launched Upstate and Central New York's FIRST Mobile Stroke Unit.